A friend of mine once hilariously expressed his disinterest in a Thundercats revamp by dismissing the feline warriors as merely "cat men". In other words, there was nothing especially distinct about the science-fantasy property beyond the idea of humanoid cats. His summation was funny because it wasn't that far form the truth. Take the story of Thundercats and put the focus on humans instead of bipedal felines and it suddenly becomes much less interesting. Well, that same friend recently came across something that has him rethinking that position and shared it with me, and now I am sharing it with you. 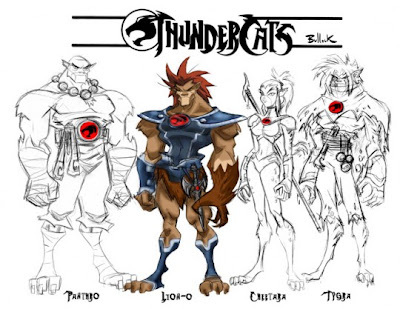 Artist Dave Bullock uploaded some character redesigns and storyboards he did for a Thundercats CG movie that never got made. They are interesting the say the least. Lion-O, Panthro, and Tygra and given broad shoulders with high torso-to-waist ratios and cat-like lower legs. The designs look made to facilitate extreme freedom of movement and fluidity. It would have been great to see them in action. Go over to Dave Bullock's Deviant Art Gallery to see more. I always thought the Thundercat rallying cry was also a great pimp call. HOOOOOOOOOOOOOOO! Some of the older breeds in cat registries can be traced far back in world history. The Japanese Bobtail, which was native to Japan, has been recorded over a thousand years ago. The Japanese Bobtail is now gone, and only stories of it exist.